A school bus is a vehicle that transports students back and forth to school. School buses – especially yellow school buses – have appeared frequently throughout cult-tv history. 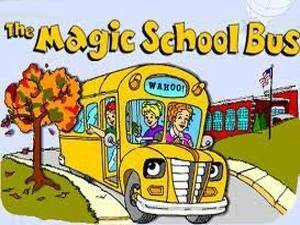 For instance, every child of elementary school age remembers The Magic School Bus (1994-1998). In terms of adult-programming, a second season episode of Chris Carter’s Millennium (1996-1999) called “19:19” involves a lunatic who abducts a school bus full of children. The question becomes: has he done so to save them from some terrible cataclysm? The second season of Veronica Mars (2004-2007) revolves around a school bus. A Neptune High School Bus, returning home from a field trip, goes over a mountain, killing many students. Veronica (Kristen Bell) must discover if someone orchestrated the so-called “accident,” if so, why they did it. What were they trying to hide? Who was the intended victim? A second season episode of The Walking Dead (2010 - ) -- "18 Miles Out" -- finds Shane (Jon Bernthal) and Rick (Andrew Lincoln) attempting to lead away from Hershel’s farm a stranger that they picked up in town, and healed after a terrible wound. That mission is easier said than done, however, when Rick and Shane come to blows over Lori (Sarah Wayne Callies), and dozens of walkers attack. 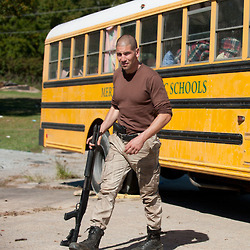 For a time, Shane takes sanctuary in a yellow school bus, and at one point it looks like Rick is ready to sacrifice him.